Romantic birthday wishes can set the tone for the entire day. If it’s your beloved’s birthday, it is likely that you are concerned about the the best possible way to express your wishes. Relax, this is common. The day is special not just for them but for you too. A lovely Romantic birthday wishes and messages can make your partner feel more special. It can also ignite a new spark and strengthen their love for you. Whether you are living together or apart, a romantic birthday wish can bring a smile to their face and heart. 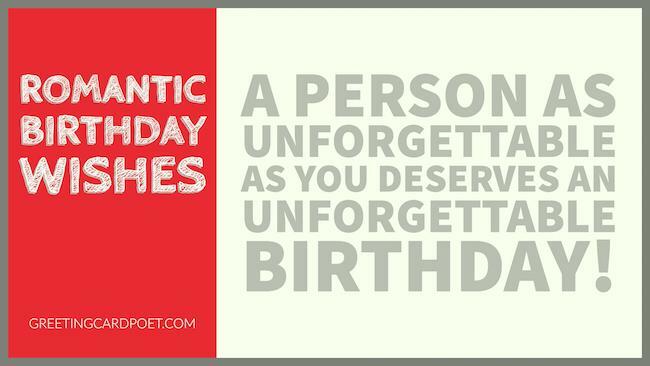 Here are some wonderful romantic birthday wishes you can share with your loved one and make them feel special! Preview these, use them exactly as presented or customize them to your needs. My day starts with you and ends with you, my love! You are my sunrise and sunset! May your birthday be bright and shower you with all the wishes you have in your heart! Happy birthday to a person who means the world to me! You one person for whom I can bear all the pains of this world! Dear sweetheart, I love you and happy birthday! I want you out know that you are the reason why I smile every day! I wish that our love will shine forever! Happy birthday to my everything, my heartbeat and my soul mate! Happy birthday to my love! Happy birthday to someone who has always brought joy to my heart! Wishing you unending happiness every day of your life! I adore everything about your – your amazing smile, your loving heart, and your sparkling eyes! You’re just too good to be true! Happy birthday dear! Happy birthday my love! I wish you have a day that shines like your smile and glistens like your eyes! I wish you a bright birthday! You are the most wonderful thing to happen to me! May you have an awesome birthday, my love! Happy birthday my love! Thank you for bringing happiness and sunshine into my life! My feelings for you keep getting stronger every day! I love you so much! Happy birthday my love! I love the your beautiful smile and the sparkle in your eyes! I want to be always by your side to see you enjoy all your birthdays! My love, I cannot express in words how much I love you! I will always wish for you to stay happy! Happy birthday! May you have all your dreams come true on your birthday! I will love you forever! Happy birthday sweetheart! Do you believe in miracles? You should because when I found you, it was a miracle. Wishing happy birthday to the most special wife in this world! I may seem to be crazy to you all the time, but I want to tell you that I love you from the bottom of my heart! Happy birthday dear! That I married you, still seems like a dream to me! We have spent so many amazing days together. Happy birthday to a beautiful and lovely wife! I love you so much! It’s not being in love that makes me happy, its being in love with you that makes me feel great! Happy birthday to the loveliest wife in this whole wide world! Tip: Romantic birthday wishes, greeting and messages mean a lot more in writing. Sure, express yourself by voice, but if you have something nice to say, put it in ink – it lasts longer. You are so important to me that I cannot think of a world without you! Happy birthday to a wonderful man! You set the example for other boys to learn from! You are the best and I love you! Happy birthday my love! Every time I see you I feel like falling in love with you for the first time! I love you! Happy birthday! Happy birthday to a special someone! I love it when you hold my hand gently, listen to me attentively, and make things right when they are not! Thanks for being a wonderful husband to me, father to our children, and son to my parents! Happy birthday! I will always love you! Sending you tons of love on your birthday! Happy birthday and I wish that this day be as awesome and cool as you are! Every minute that passes, my love for you increases and becomes even stronger! Happy birthday to my love! Happy birthday to a loving, inspiring and smart man! This birthday lots of love and kisses are coming your way! You are the most beautiful flower in a garden! When you are around, I feel like I am in heaven! Happy birthday and I love you! You are a the best gift in my life! On your birthday, I want to give you the gift of my love! I love you! Happy birthday! I love you! Let’s spend the day without any other cares in this world! This is a day for a big birthday celebration that you will remember for a long time! The day cannot start without the sunrise and my day cannot start without a thought of you! Thank you for being with me. Happy birthday and I love you! I am grateful to have you in my life! Wishing you a great birthday and thanks for being there for me! I love you with all my heart! I know that day you were born was a lucky day for everyone around you! You have enriched my life like anything! I love you more than you can ever imagine! Happy birthday! Everything in this world can be broken, but not our love! Happy birthday and I want you to know that I love you! I wish that all your days will be as special as your birthday! I would do anything to keep you happy! Happy birthday my love! Happy birthday sweetheart! On your special day I want you to know that I feel lucky to have you! Having you in my life is nothing less than a miracle! It is a dream come true! Happy birthday, my love! I will never forget how my heart skipped beats when I first saw you! My love for your has continued to grow stronger every day! Happy birthday, my love! I may not be there, but our love will always bind us close together! Happy birthday to my love! On your birthday, I have named a very special star after you! Every time you look up, you will know that I am watching over you! Happy birthday! If you have any suggestions for Romantic Birthday Wishes, please let us know via the Contact page. Thank you very much.